Robbie Calvo Sweet Notes. Most of us have been taught to solo and improvise by learning how to play specific scale patterns over certain chords and progressions. The classic example of this is the minor pentatonic scale, which we are told works beautifully over any I IV V progression. And sure enough, millions of guitar players blow minor pentatonic scales incessantly without worrying about the ‘chord changes.’ For the most part, those notes do indeed work BUT there’s still something missing. Where are those ‘sweet notes’ that our guitar heroes are playing? Sweet Notes to the rescue! The next challenge that most of us face is playing over the chord changes and progressions commonly found in rock, jazz, country, R&B, and other popular music. This is usually a big wake-up call reminding us how little we know about harmony and improvisational theory. And to make matters even more daunting, we need to learn how to play over those changes in position rather than moving all of the fretboard chasing those 6th and 5th string rooted scale forms that we tend to be more comfortable with. Sweet Notes to the rescue yet again! Robbie’s definition of a ‘sweet note’ is a note that is found both in the scale being played, and also in the chord that the scale is being played over (AKA chord tones or arpeggios). Just learning how to identify and target those sweet notes as resolution points, will singularly take your improvisations from B&W to color. But there’s so much more to dig in to. Each “chord tone” has its own character and you will learn how to spice up your improvisations accordingly. You’ll also learn how to apply the approach with extended and altered chords, and it’s here that you will likely find those “missing” notes on your fretboard. Of equal importance, you’ll learn how to apply the Sweet Notes approach in a single position so that you can improvise over any set of changes without having to move all over the fretboard. You will play your way through Robbie’s Sweet Notes curriculum without having to work your way through tedious theory and exercises. In addition to all of the video guitar lessons, Robbie’s also prepared 31 practice rhythm tracks, transcriptions and a ton of charts to practice with and use as reference material – an 80-page manual of charts, tabs and notation is included! 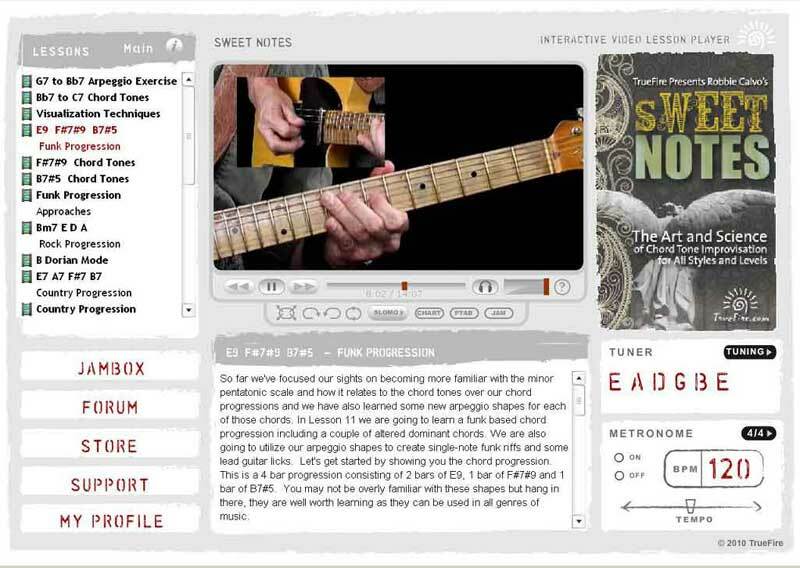 The Sweet Notes approach can be applied to all genres of music and is designed to guide, inspire and push your capabilities as a guitarist regardless of your level and playing ability. Put your time in with the course and Sweet Notes will prepare you how to play and improvise over any chord changes, and progression, and across any style of music.